Can a humble Caesar Salad be a complete weekday meal? With this recipe, yes it can! 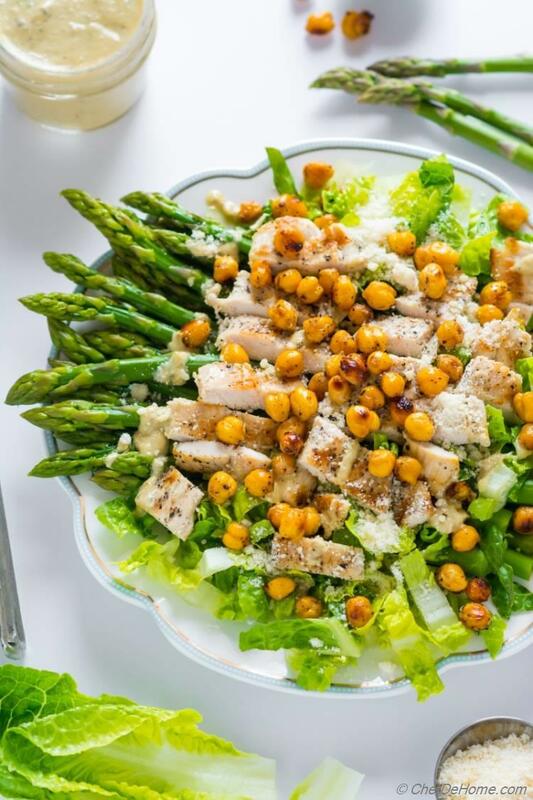 This recipe for Chicken Caesar Salad - is a healthier and more delicious take on classic Italian romaine Caesar salad with blanched asparagus and crunchy roasted chickpeas croutons! Gluten free, and packed with nutrients! I call it, Chicken Caesar 2.0! Chicken Caesar Salad is an amazingly crunchy, garlicky, and fresh salad! With nutty parmesan and moist cooked chicken.. this salad is dream-come-true for Chicken Salad lovers. During Spring-summer season, we eat lot more salads for dinners and this salad is often on our weekday menu. I like to prepare a batch of Caesar dressing on weekend, and grill some or use rotisserie chicken. 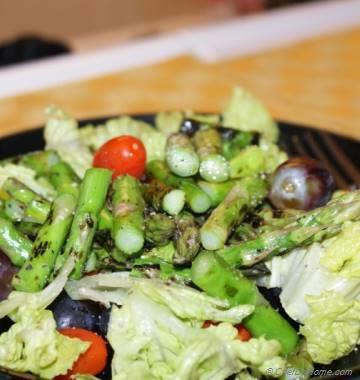 On weekdays, salad comes together as soon as I have the asparagus ready! Oh, and need I say, it looks darn delicious too?! Imagine serving a salad this bold for a dinner party! It will win you lot of applause, for sure! Caesar Salad also happens to be one of our favorite salad to in Italian Restaurants. Vishal is so fond of it that he will happily, easily eat it for all three meals. And he is not even a salad person, per say. He likes it, not just because it has chicken (you know), but also (for a change) because it has crunchy romaine lettuce. When eating out, this is one salad for which I have to first confirm if Caesar Dressing has anchovies or mayo.. (I can't eat both). At home, I use my homemade mayo-free Caesar Dressings and often add some substantial greens with regular lettuce, grilled chicken for a healthier Chicken Caesar! This salad really is a complete lite meal... Much more than restaurant's chopped romaine side salad. 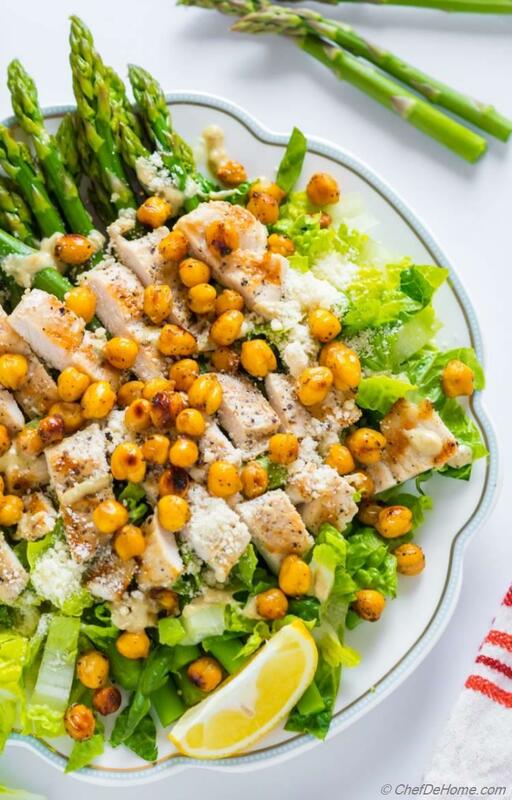 First step for this Asparagus Chicken Caesar Salad recipe is to cook asparagus perfectly. It is important because crispy and green cooked asparagus compliments the crunch of romaine lettuce very well. Limping, yellow overcooked asparagus does not belong in crispy salads such is Caesar. What I like to do is blanch - cook in hot boiling water than shock in ice cold water. This simple step ensures green, crisp and perfectly cooked asparagus, every time! Second important step is perfectly cooked and moist chicken. I like to use chicken thighs for this recipe. Chicken thighs stay moist when cooked fast or on direct heat. You can go fancy and bake chicken with parmesan and all... but in this Caesar salad recipe, I have used parmesan in dressing and sprinkled on top too. So, for me simple grilled moist chicken works perfectly fine. These is lot of flavor around it to make it taste scrumptious. When in hurry, I often use rotisserie chicken for this salad. No Caesar salad is complete with Ceasar Dressing! It is one of the most important part of a good Ceasar salad! Like I said, I use homemade no-mayo dressing for personal preference. I can tell you that it tastes far better than any store-bought jars. But, if you are okay with mayo/anchovies.. please feel free to use dressing of your choice. I cannot say this recipe is complete without my roasted Chickpea Croutons! I always think, croutons can be much more than just toasted bread. If you like to go adventures with salad croutons - try these Cheesy Naan Croutons or Crispy Onion Croutons! Well, I'm fascinated with roasted chickpeas these days. Trust me, you will fall in love with these too! Just give'em one try! Not only healthy, chickpeas bake crunchy, and absorb flavor just like piece of bread. Plus are gluten free. I roasted chickpeas with some garlic and oil. Oh man, did these complement Caesar Salad!? I'm adding them to lot more salad these days! I'm so glad and was waiting for long to share Chicken Caesar salad with you! A little late in week but glad to share with before long weekend! If you planning some family-time together? I recommend serving this salad. It can work as main course side salad or even a substantial salad course. If serving chicken for main course, you can make this one without chicken too. All ingredients for Caesar salad can be prepared in advance. You can ready chicken (if using), blanch asparagus, prepare Caesar dressing, even chop lettuce and refrigerate. I recommend drizzling dressing, adding parmesan cheese and croutons just before serving. I hope you enjoy! On this note, I sign off for today! Wish you all a happy Easter, happy Good Friday, and a happy long weekend! 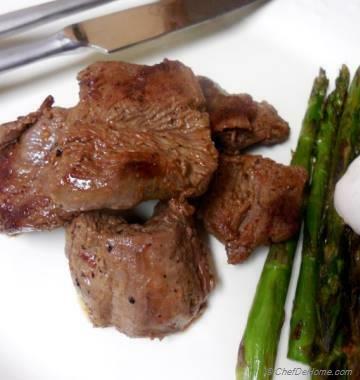 Total Time 25 minutes Prep Time 10 minutes Cook Time 15 minutes Difficulty Easy Yields 3 Servings Serves 3 Notes No. of servings depends on serving size. 1. Roast Chickpeas: Preheat oven at 450 degrees Fahrenheit. Pat dry rinsed chickpeas with a paper towel. In a bowl, toss chickpeas with 1 tbsp olive oil, garlic powder, lemon juice, and generous few pinches of salt and black pepper (as per taste). Spread on baking sheet (lined with parchment paper), and bake for 22-28 minutes, or until chickpeas have browned and crunchy. Watch carefully for last few minutes to avoid burning. 2. 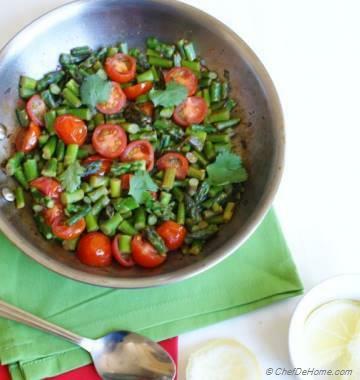 Blanch Asparagus: In a wide bowl (that can hold asparagus), add water and ice. Set aside. Bring a pot of water to rolling boil, season with salt. Drop in asparagus and cook for 5 minutes. Then immediately shock it in cold water to stop cooking. Remove from water when cold to touch and set aside. 3. Prepare Chicken: Heat grill or a heavy bottom pan. If chicken breasts are very thick, slice them lengthwise in half or pound with meat-pounder. Massage 1 tbsp oil on chicken. Season with salt and black pepper. Place chicken on grill and cook each side for 3 minutes or until chicken is cooked through. Thicker piece of meat will take longer to cook. Make sure chicken is cooked fully. 4. 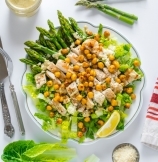 Assemble Chicken Caesar Salad: On a salad platter, place asparagus and top with chopped lettuce romaine. Top with sliced grilled chicken, drizzle ** Caesar dressing on top. Sprinkle grated parsmean cheese. Top with roasted chickpeas. Serve and enjoy! **Caesar Dressing: I have used homemade Caesar Dressing for this recipe. Isn't it Spring on plate! You read my mind, Judee! thanks! 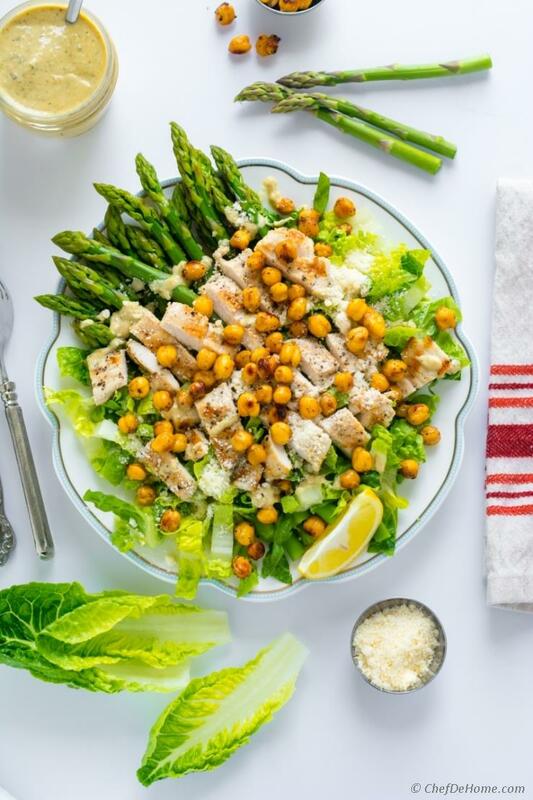 Feel free to leave out chicken, it is still a delicious salad with veggie protein from chickpeas. I hope you get chance to try sometime. Thanks for stopping by!